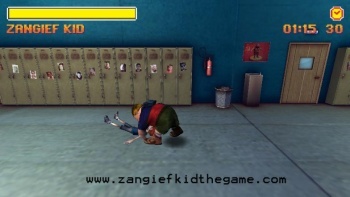 Casey Haynes' (aka Zangief Kid) pile-driving of a school bully has finally been immortalized in a game where you beat the crap out of baseball cap-wearing bullies. A few weeks ago in an Australian school, Casey Haynes fought back against a bully, pile-driving him into the cement and becoming an internet celebrity when the video of it hit Reddit. The video was remixed with several games such as Team Fortress 2 and Street Fighter, and has even become a Taiwanese Animated News feature. And now, he has a videogame all his own. The game, made by an eight-man Brazilian team in one week, features a 3D rendering of Casey as he prowls the hallways of a school, ready to dish out some righteous bully-breaking fury. As he wanders the hallways, he is attacked by roving scrawny, hat-wearing bullies modeled off the original bully, Ritchard Gale. Because it would violate the "Bullying Retribution Code" to simply go around beating kids up, you have to wait to be hit at least once before you let slip the dogs of war and pile-drive your tormentors. I'm not positive how, but I managed to accidentally activate some sort of super-mode, where Casey transforms into the character Zanief from Street Fighter, removing your limitations on when you can attack and turning your attack into a spinning whirlwind of fists. It's not exactly a great game, with about 30 seconds of pretty bland play time, but at least Casey will always be able to brag that he has a videogame about him and his exploits. How many people can say that? You can play the game over at ZangiefKidTheGame.com, and lay some well-earned hurt.